Milk Bar has opened at The Cosmopolitan of Las Vegas. Christina Tosi's bakery started in New York after the success of her sweets for the Momofuku restaurants. 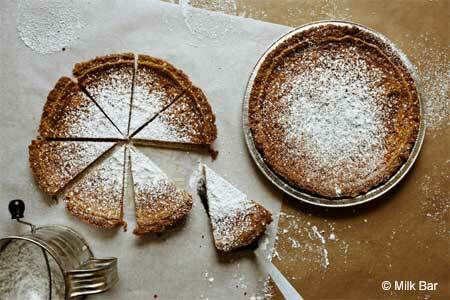 Her famous creations include "Cereal Milk" ice cream, "Compost Cookies" and "Crack Pie." Exclusive to the Las Vegas location are alcoholic "Fancy Shakes" and "MilkQuakes," which blend house-made soft-serve ice cream with treats to create flavors like B'Day Cake. Milk Bar, 3708 Las Vegas Blvd. S., Las Vegas, NV 89109, no phone. Hawthorn Grill at JW Marriott Las Vegas Resort & Spa is now open and features steakhouse fare and American classics as well as an extensive wine program with more than 1,100 wines. The space includes a bar and lounge, large dining room with semi-enclosed booths, private room and an outdoor patio with a waterfall. Chef Joseph Swan (Eiffel Tower) oversees the kitchen as executive room chef, and pastry chef Jeremy Choo directs the sweet aspect of the menu. Dishes include filet mignon with red wine jus, NY striploin with béarnaise and a bone-in rib-eye with black truffle butter. The restaurant is open daily for breakfast, including a signature breakfast buffet, dinner and bar hours. Ceres and Carmel Room have merged with Hawthorn Grill. Hawthorn Grill, JW Marriott Las Vegas Resort & Spa, 221 N. Rampart Blvd., Las Vegas, NV 89145, 702-869-7777, 877-869-8777. Vic “Vegas” Moea, who has appeared on Food Network’s Next Food Network Star, Big Bash Catering Competition and Food Truck Face Off and Spike TV’s Bar Rescue, has opened 7 Sinful Subs across the street from UNLV. Dine-in and take-out options are offered for oddball sandwiches that have entertaining names and unique flavor profiles, such as the Knuckle Sandwich with grilled salami, pepperoni, ham, lettuce, tomato, mayo, Champagne vinaigrette and melted mozzarella; and the Skinny Dip with grilled shaved sirloin, sautéed onions, red roasted peppers, mayo, American and mozzarella cheeses and au jus. 7 Sinful Subs is open Monday through Saturday from 11 a.m.-7 p.m. and Sunday from 11 a.m.-3 p.m. 7 Sinful Subs, 4632 Maryland Pkwy., Ste. 12, Las Vegas, NV 89119, 702-998-2555. Evel Pie, a pizzeria operated in cooperation with Evel Knievel’s son Kelly, has opened downtown on Fremont Street. Décor is a mini-shrine to the legendary daredevil with nearly every inch of the walls covered with Knievel memorabilia, and a hand-painted mural of Snake River Canyon, vintage 1977 Evel Knievel-themed pinball machine, a bronze statue of Evel and an illuminated marquee sign bearing the restaurant’s motto: “Live Hard, Ride Fast, Eat Pizza.” On offer is NY-style pizza that can be customized with 18 different toppings or guests can choose from the specialty menu, featuring pizzas such as “world famous Snake River special” with rattlesnake jalapeño sausage, onions, bell peppers and fresh garlic. Pies are paired with a selection of American beers including several local brews like Crafthaus Saison, Joseph James Weize Guy and Tenaya Creek Bonanza Brown. Evel Pie, 508 E. Fremont St., Las Vegas, NV 89101, 702-840-6460. Situated at the north end of the Las Vegas Strip, Lucky Dragon Hotel & Casino celebrated its grand opening on December 3, 2016, and is the first Vegas casino resort designed from the ground up to debut since 2010. Its restaurant collection includes five concepts. Dragon’s Alley, inspired by Asian night markets, serves fresh seafood, dim sum, barbecue and boba tea. Bao Now offers dim sum, noodles, congee and other items intended for eating on the go. Pearl Ocean features dim sum and a live seafood room. Phoenix is a fine dining venue with a menu of Kurobuta pork, deer tendon, abalone and other rare delicacies. Cha Garden is directed by Las Vegas’ only tea sommelier, and offers a list of more than 50 teas sourced directly from generations-old tea farms in Asia. Lucky Dragon Hotel & Casino, 300 W. Sahara Ave., Las Vegas, NV 89102, 702-889-8018. Bailiwick is now open at Orleans Hotel & Casino, occupying the former Brendan’s Irish Pub space. The renovated setting is designed to evoke the look and feel of a repurposed 19th-century industrial building, with steel I-beam detailing, a steel louvered entryway and a curated collection of antiques. The menu lists items such as Japanese miso-grilled tuna tacos topped with toasted sesame slaw and Sriracha cream; classic poutine finished with cheese curds, brown gravy and fried egg; a BLT slider with house-made bacon marmalade, fried green tomatoes and pimento cheese; and toffee cake drenched in a Macallan 12 whisky sauce. The bar offers 38 draft beers with six local brewery taps and more than 20 handcrafted specialty cocktails, including three that are barrel-aged in-house for at least 30 days. Bailiwick, Orleans Hotel & Casino, 4500 W. Tropicana Ave., Las Vegas, NV 89103, 702-365-7111, 800-675-3267. Morels French Steakhouse & Bistro at The Palazzo Resort Hotel Casino is serving a new "secret" prix-fixe bar menu. Priced at $58, the three-course menu includes a different steak selection and side each week as chosen by executive chef J.L. Carrera, a Boggiato Farms baby iceberg salad, macaron ice cream sandwiches and unlimited glasses of Vanishing Point Pinot Noir. Morels French Steakhouse & Bistro, The Palazzo Resort Hotel Casino, 3325 Las Vegas Blvd. S., Las Vegas, NV 89109, 702-607-6333. Chef/owner Daniel Krohmer has released a seven-course chef's tasting menu experience at Other Mama. The menu will change monthly and is available every Friday and Saturday evening in limited numbers. The multi-course dinner experience is priced at $75 per person not including tax, tip or beverages. Reservations must be made in advance by calling 702-463-8382. Other Mama, 3655 S. Durango Dr., Ste. 6, Las Vegas, NV 89147, 702-463-8382. Emeril's New Orleans Fish House at MGM Grand Hotel & Casino has launched a four-course winter tasting menu showcasing the restaurant's signature and new dishes from chef de cuisine Jean Paul Labadie. Priced at $55, the menu consists of first and second course options of hamachi lettuce wraps with ponzu and serrano chili, Creole boiled shrimp cocktail with local micro greens, gumbo with shrimp and andouille sausage and butternut squash soup with foie gras emulsion and crispy duck confit. Entrée choices are grilled filet of beef with roasted smashed sweet potatoes and rum reduction, pan-fried rainbow trout with jumbo lump crab, herb-roasted free-range chicken breast with bacon-braised Brussels sprouts and Emeril's sweet barbecued organic Scottish salmon with andouille pork sausage. Dessert is pecan pie, Emeril's banana cream pie or bread and butter pudding with homemade vanilla bean ice cream. An optional wine pairing selected by sommelier Scott McSimov is available starting at $35. Emeril's New Orleans Fish House, MGM Grand Hotel & Casino, 3799 Las Vegas Blvd. S., Las Vegas, NV 89109, 702-891-7374. After 26 years, the iconic Hard Rock Cafe, with its towering neon guitar that sits at the front of Hard Rock Hotel & Casino, is slated to close after New Year’s Eve 2016. In a statement Hard Rock International said the closing marks a strategic decision by the brand to focus efforts in the market on Hard Rock Cafe Las Vegas Strip and Hard Rock LIVE Las Vegas at 3771 Las Vegas Blvd. South, the three-story restaurant and music venue which opened in 2009. Although they share a name, the cafe and the hotel are not owned by the same organization. The hotel and the land the cafe sits on is owned by Brookfield Asset Management, which has use of the Hard Rock name through a licensing deal with Hard Rock International. Hard Rock Cafe, Hard Rock Hotel & Casino, 4475 Paradise Rd., Las Vegas, NV 89109, 702-733-7625.